Catch those bad dreams and scary nightmares with old traditional methods mixed with a new style. 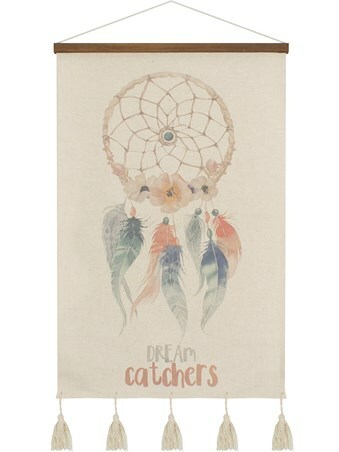 This hanging canvas banner is the perfect way to feature those beautiful dreamcatcher feathers and patterns in to a piece of art you can have on your wall in any room of the house, even for when you fall asleep on the sofa! In a light pastel watercolour style with cream tassels, this accessory is sure to add a comforting touch to your home. High quality, framed Dreamcatcher, Catch The Storms canvas print with a bespoke frame by our custom framing service.